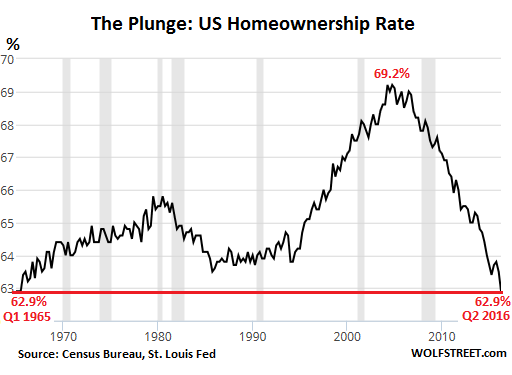 If the rise was based on the same idea as Aus "you get rich buying a house" and the decline based on foreclosures you would expect a return to "normal". There is nothing "normal" in the graph. I would have expected it to be run back to post WWII at least to show a gradual (I assume) increase to the seventies. That would make the graph better visually. If they didn't do that I assume either home ownership wasn't tracked back then or it made a bad visual. If the rise was based on the same idea as Aus "you get rich buying a house" and the decline based on foreclosures you would expect a return to "normal". They overshot to the upside and now it will be to the downside - the pendulum swings both ways.